Coconut is a gift from Mother Nature to us especially when it comes to skin as you can make face packs from any form of its extract be it coconut water, coconut oil or coconut milk. How To Use Coconut Oil For Skin Whitening? Oatmeal Coconut Facemask For Acne Prone Skin. When it comes to acne, coconut oil is an excellent choice because of its anti-bacterial properties. This facemask is great for acne-prone skin as the oatmeal works to soothe inflamed skin by restoring its natural pH balance. Lemon, Yogurt And Coconut Oil Face Mask For Oily Skin. This lemon, coconut oil and yogurt facemask works wonder for your skin as it nourishes and hydrates your skin cells while also working to protect your skin from damage and aging. Best results for oily skin as it gently exfoliates to deep clean your pores. Baking Soda and Coconut Oil Mask For Blackheads. This facemask helps to clean your skin by getting rid of dirt and dead skin cells from your pores while simultaneously brighten your skin instantly. Honey, Green Tea and Coconut Oil Face Mask For Radiant skin. This combination of coconut oil, green tea and honey is rich in anti-oxidants that help in soothing and detoxifying your skin, leaving a moisturized and radiant look. Anti-Aging Mask With Coconut Oil and Avocado. Avocado and coconut oil both work to hydrate and nourish your skin, protecting it from premature aging. Coconut Oil and Turmeric Mask to Lighten Skin. The combination of coconut oil and turmeric help with skin discoloration by evening out your skin tone. It also works to hydrate and moisturize your skin to help fight fine lines and wrinkles. The benefits of coconut water being an antioxidant, anti-aging makes it a wonderful ingredient is making facemasks. Using a light moisturizer after the facemask yields better results. Here are a few coconut water-based facemasks. Coconut water face pack for pigmentation. 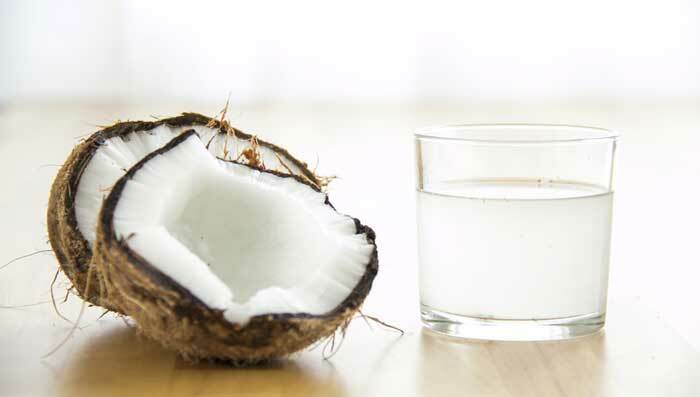 Coconut water is a natural source of vitamin C, which helps to remove pigmentation. The combination of coconut water and fuller’s earth is rich in antioxidant. This face pack help to clear any form of pigmentation. Coconut Water Anti-aging Mask. Coconut water is rich in Cytokinins, which is also called an anti aging hormone. A combination of coconut water and yogurt facemask helps keep your skin young and radiant. Coconut Water Skin Brightening Face Mask. Coconut in any form has many amazing health benefits as mentioned before. Not only does it make your skin healthy from within but also brings fresh glow to your face. Loaded with nutrients, it helps with brightening your skin and reducing effects of anti-aging. Consider adding coconut water to your daily routine as a beverage for ultimate hydration. It also acts as a great alternative to other beverages which are high in sugar and unnecessary calories. However, do remember to consume adequate amount of water.